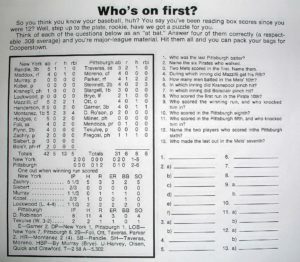 Question #12 – Name the two players who scored in the Pittsburgh 6th. Answer – We kind of answered this one by default with the previous question, but by way of recap: Taveras scored his first run of the game in the 6th inning, when he led off the inning with a double. Moreno went quietly, but Parker doubled Taveras home. Siebert was brought in to face Stennett, and gave up the single that brought Parker to the plate with the 2nd run of the 6th inning.